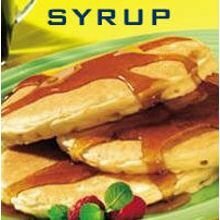 Dunns Farm Sugar Free Maple Pancake Syrup, 1 Gallon -- 4 Case The sweetness of natural flavors, without added sugar. Our syrup is a delicious, healthy, sugar-free syrup. Now you can top a steaming hot waffle or tender, light pancake with a great-tasting syrup without the calories or guilt. Like every product from us, its the perfect blend of great taste and sensible nutrition. 35 calories per 1/4 cup serving - Over 80% lower in calories than regular pancake syrup.